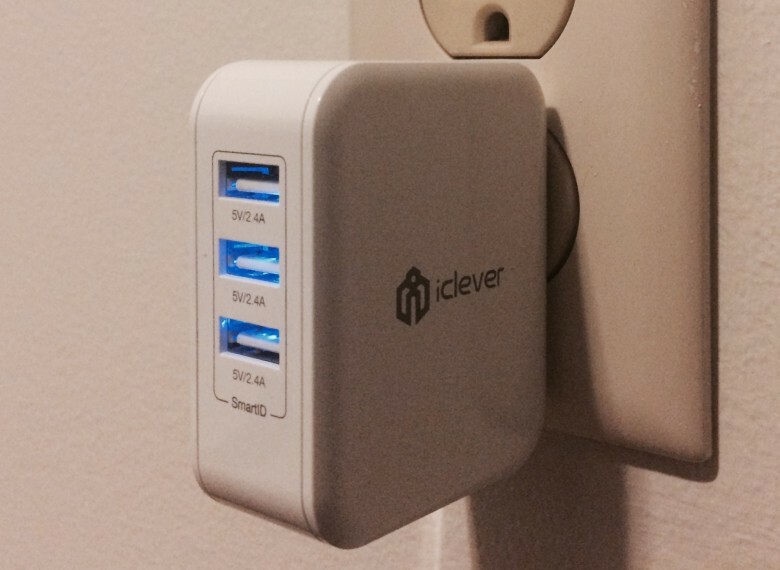 iClever’s BoostCube line includes chargers with one, two, three, four, or even six USB ports if you have that much stuff to power, but the three-port version feels like the right size for daily use. It just plugs into the wall, and then you have a trio of spots to plunk in standard USBs to run to whichever devices need charging. I have one port dedicated to my Apple Watch charger and one Lightning cable that I can use for either my iPhone or iPad. And that leaves the third free for anything else that might come up, like my Kindle or Lumiére lamp. It’s a pretty slick setup, and I already prefer it to the brick-crowded power strip I was rocking before. Speaking of those power bricks, it’s really nice to know that next time I travel, I can just toss the BoostCube into my bag and leave those things at home. The adapter for the Air 2 alone is over half the size of iClever’s gadget, and then I’d have one or two of the other blocks to pack. And obviously, packing two or three adapters versus one is not going to spell the difference between whether or not my suitcase closes, but I’m always in favor of streamlining. So I really like the BoostCube. It’s saving me space at home, and if I ever take one of those “vacations” I’ve heard so much about, it’ll help me out there, too. iClever provided Cult of Mac with a free review unit for this article. Learn about more lust-worthy products.